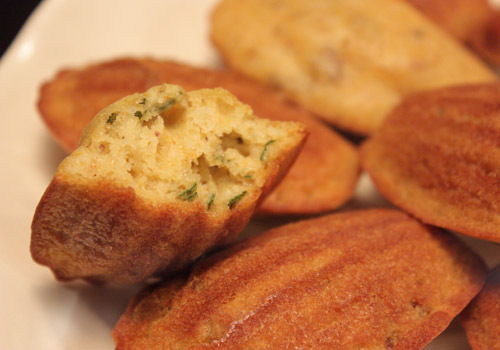 Savory Madeleines sounds like a great idea! I definetely have to try it :) Do you recommend the recipe you used or not so much? Nurit: I do recommend this recipe. They're light and lovely. I might add some grated cheese to the batter next time. 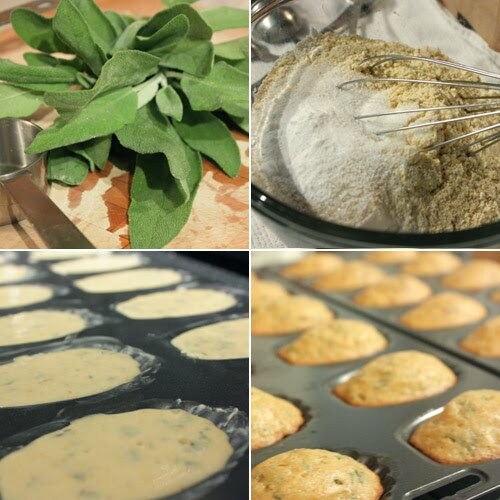 I've never tried savory madeleines beore!! They look delicious! I never made a savory madeleines. Sounds wonderful Lisa! Delicious! I love savory Madeleines! Savory is good especially since I love these cookies. They came out really lovely and perfectly shaped. Lisa, these savoury madeleines are perfectly baked and yes, I would probably also add some cheese over! These look wonderful, and your pictures are fab. I'd love to try a savoury madeleine. Have a super weekend daaaaaaaahling. Clever you! I bet there are a lot of surprised faces when they bite into these. Never had one and never have seen a recipe for them. I think the addition of some cheese would be super! What an elegant way to serve corn meal! They sound wonderful! For YEARS I've been resisting the urge to buy madeleine pans. Why, oh why are you doing this to me now? congratulations, lisa--you've just revealed the very first savory madeleines i've ever seen. i didn't even consider it a possibility, but they're splendid! 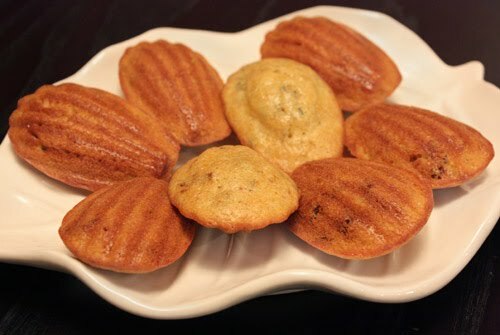 I love the idea of savory madeleines! They're beautiful and I love the sage flavor! The first time I ever had a savory madeleine was at Manresa restaurant in Los Gatos. They begin the meal with savory, olive madeleines, and end the meal with sweet ones. It's a way to bring the meal full circle. Great idea! Madeleines are always so pretty to look at. MMMMMM,...your savoury madeleines look excellent!! Just lovely & apart too! What a great twist on traditional madeleines - they look delicious! I really want to get a madeleine pan. I have seen savoury madeleines once before on flickr and thought it was brilliant at the time too! I am not sure how big the 'hump' is supposed to be but I love how they look! Gorgeous! I've also always eyed the Madeleine recipes in all the food magazines with suspicion. Never had the guts to try. Then again, I'm not a hot shot as it comes to cookies at all. I have never tackled madeleines but, I am rethinking that position after seeing these beautiful treats. So beautiful. You blogs are so getting me on the baking band wagon...these sound so tasty and I too like the flavor combination! I am also with Velva, could go on forever... I did my Great Outdoor post...I was looking for a fellow Texan to take a photo of their store front, but oh well...busy busy busy season right? I'm so glad you made these. I love savory cookies and can't wait to try these! Both of those look terrific. I bought a silicone madeleine pan a couple of years ago and it is a true flop. I haven't used it since. Now I need to go buy a real one. I always love the idea of savory! 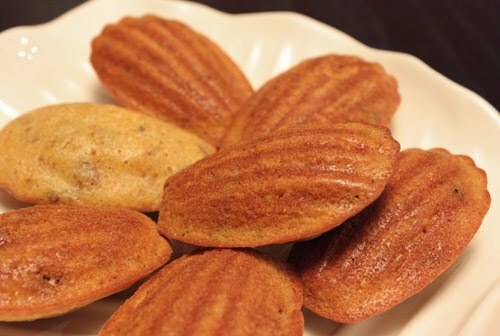 I love, love, love madeleines. I often make them for desserts but I also have a fantastic blue corn madeleine recipe that I bake at the holidays. These savory ones look like a lot of fun for a party - yet another addition for my Super Bowl menu.